Dudley Station around 1910. The upper level has El trains as well as some streetcar loops, with more streetcar loops on the lower level. Of all of Boston's historic transit hubs, Roxbury's Dudley Square is the one whose current state most closely resembles its original one. 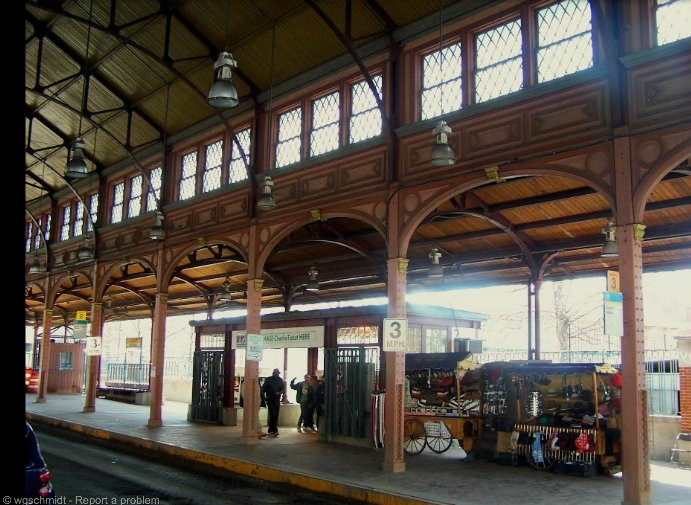 Down to the station building, which is the original one that began serving El trains and streetcars in 1901, Dudley Square is home to various historic buildings, many of which serve the same purposes they did over one hundred years ago. Likewise, Dudley Station continues to host most of the same transit routes that it has over the years, continuing to draw customers to surrounding businesses as it always has. 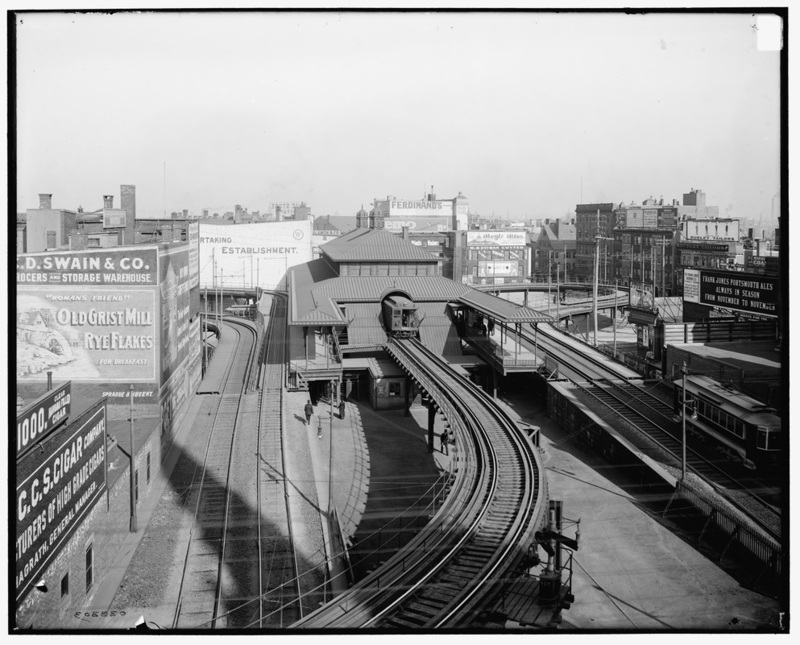 Dudley Square had always been the commercial center of Roxbury, but after Dudley Square station opened in 1901, the square subsequently became one of Boston's busiest and most influential commercial centers. As shown in the photograph above, many prominent stores of varying genres called Dudley Square home, making the square a popular and practical destination for shopping. Dudley Square's rise was very much due to the fact that it was so well served by public transit. With the Washington Street Elevated and over ten streetcar lines coming from everywhere from Dorchester to Brookline to Jamaica Plain stopping there, Dudley Square was very easy to reach for people at a time when cars were owned by only the most exclusive tiers of class. 1943 BERy map showing ten streetcar lines and three bus lines, as well as the Washington Street Elevated, serving Dudley Station. With a diverse mix of businesses, Dudley Square was not only a shopping destination but a place one went to enjoy oneself. In addition to department stores, such as Ferdinand's Blue Store whose imposing building still towers over the square today, one could find the latest attractions, such as vaudeville theaters and bowling alleys, in Dudley Square. Dudley Square in the 1930s. There are various well-kept businesses; notable are the Hotel Dartmouth, an apartment-hotel converted to business space around 1930, in the foreground, and Ferdinand's Blue Store in the right rear. At the center of the square is Dudley Station, whose distinctive roof is visible between the Hotel and the Store. Note the streetcar and tracks on Warren Street on the right. The growth of Ferdinand's Blue Store was closely linked to the construction and operation of streetcar lines and the Washington Street Elevated in the area. 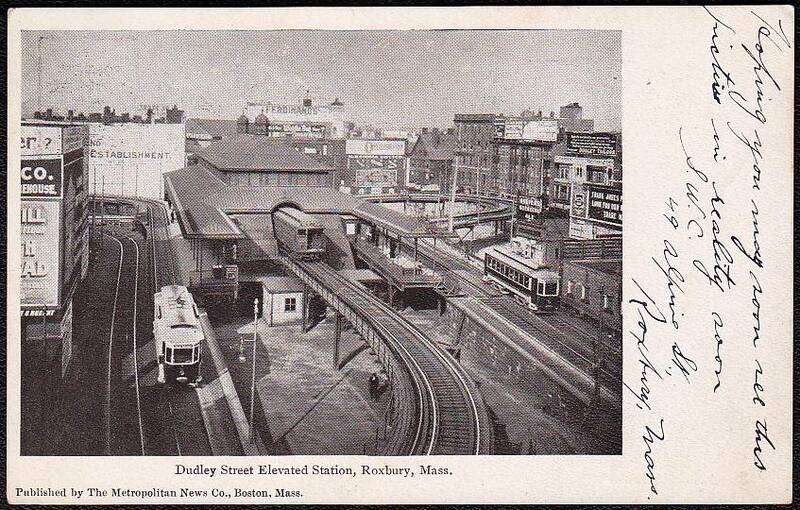 The store opened in it's Dudley Square location around 1895, about five years before the opening of the elevated Dudley Station, at which time streetcars from all around Boston already served Dudley Station. By the early 1920s, the store attracted so much business that it required substantial expansion. Therefore, an annex to the current building was constructed with a direct link to Dudley Station, proof that the owners of the store saw public transit as key to the store's past, present and future business. Ferdinand's Blue Store in Dudley Square in the 1920s. Note the sign on the upper right reading "Dudley St Terminal" pointing pedestrians to Dudley Station and the sign on the upper left reading "Annex." The building marked "annex" is the addition built in the early 1920s adjacent to Dudley Station. Also note the streetcar on the street on the bottom right. Dudley Station represented the prominence of the square in its construction. With sweeping ceilings and metalwork with great attention to detail, the station was a crucial point within BERy's system as well as one of the system's crown jewels. The grand El platform of Dudley Station. Image courtesy Ward Maps. Over the years, as Roxbury, like much of Boston, underwent significant changes, Dudley Square's characteristics began to shift. By 1952, almost no streetcars ran in Dudley Square, with only one line, the 10 to City Point, remaining. The 10 streetcar was bustituted soon afterwards, in 1953. 1952 MTA map showing five bus lines, six trackless trolley lines and one streetcar line serving Dudley Station. It is worth noting that trackless trolleys were the main mode of surface transportation in Dudley Square in 1952. By 1964, virtually every trackless trolley line in Boston had been replaced with a bus line (more on that in Trackless Trolleys), and the only surface transportation lines in Dudley Square were bus lines. 1964 MTA map showing twelve bus lines serving Dudley Station. These lines include every single trackless trolley or streetcar line that ran through Dudley Station in 1952. By 1970, Dudley Square had fallen upon hard times. With the impending construction of the Southwest Expressway and Inner Belt through Roxbury (more on that in Boston's Cancelled Highways), the latter of which would have been built 0.2 miles away from Dudley Square, Roxbury experienced property abandonment and increased crime, which altogether led to significant declines in property values and in the overall appeal of the area. Beginning in the 1960s, demolition of existing infrastructure began along the planned routes of the highways to clear the way for their construction. By the 1970s, areas of Roxbury that had once been vibrant commercial centers were bare, decrepit pits. Many of those buildings that were not razed for highway construction fell victim to abandonment and subsequent arson. Traditional retailers in the area, such as Ferdinand's Blue Store, closed their doors around the time, leaving their buildings to join the trend. Despite the changing nature of the neighborhood, Dudley Station soldiered on as a vital Boston transit hub. 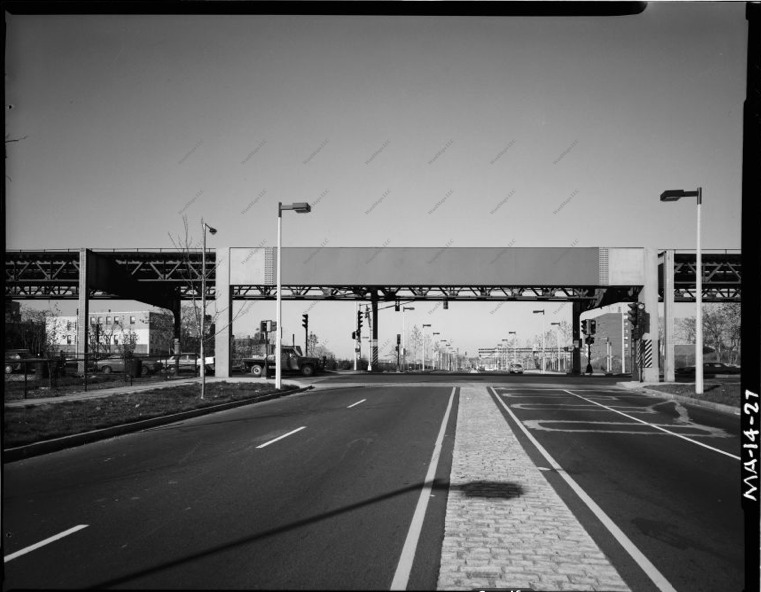 Buses and elevated trains ran through the neighborhood throughout the 1970s and into the 1980s, by which time Melnea Cass Boulevard had been constructed along the planned route of the Inner Belt and Dudley Square had developed a reputation for crime and deterioration. Melnea Cass Boulevard at Washington Street near Dudley Square in 1982. Note Washington Street Elevated tracks above. Image courtesy Ward Maps. Dudley Station and Square in 1982. Note litter, shrubbery and deteriorating station structure. Image courtesy Ward Maps. Dudley Square experienced further change in 1987, when the Washington Street Elevated, its rail link to downtown Boston, was torn down and the Orange Line rerouted one mile west to the planned route of the Southwest Expressway. Now, the only transit lines passing through the square were the thirteen bus lines that still stopped there. 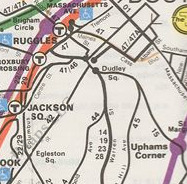 1988 MBTA map showing thirteen bus lines serving Dudley Station. Note that the Orange Line has been rerouted one mile west. While Dudley Square was no longer a rail hub, the removal of the El both literally and metaphorically shed a new light upon the area. Now that the elevated tracks no longer left pedestrians below in the dark, the area was in a position to be renewed as a commercial center for a new generation. 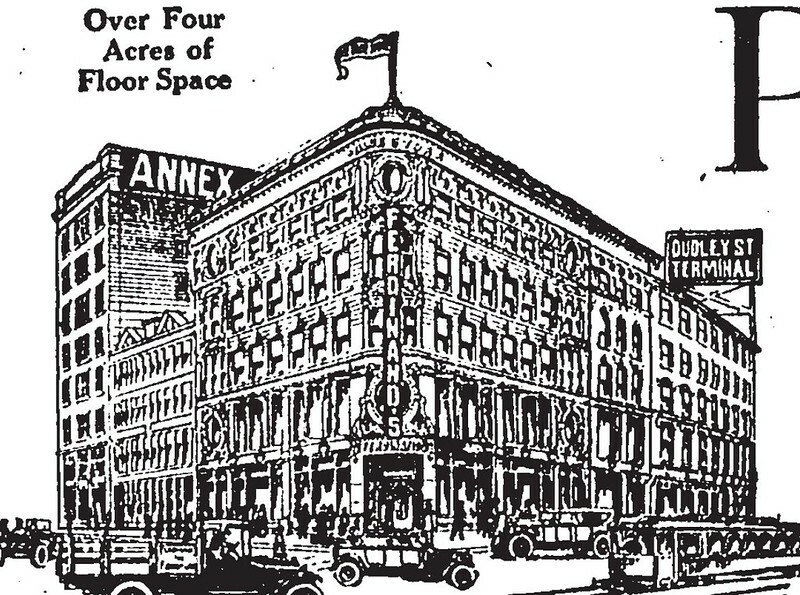 While long abandoned and vandalized accordingly, former hubs of commerce such as the Ferdinand's building still stood, ready to be repaired to serve the since-changed square. 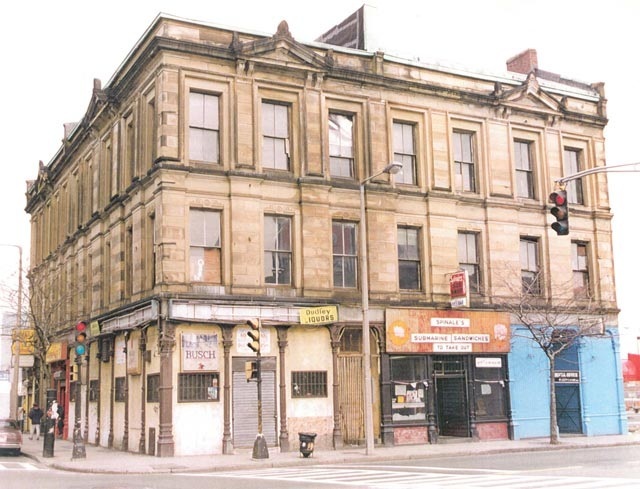 Accordingly, throughout the 1990s plans began to be drawn up to restore Dudley Square. In the 1990s, a brand-new post office opened on Roxbury Street. Soon afterwards, around the year 2000, both the former Roxbury Boys and Girls Club and Palladio Hall were restored. Today, the buildings house government offices and shops, respectively. The beautifully restored Palladio Hall at the corner of Dudley and Warren Streets. Across Warren Street are Dudley Station and Hotel Dartmouth. Palladio Hall prior to restoration. Image copyright Nuestra Comunidad Development Corporation. More recently, heralded by the restoration of Palladio Hall, buildings in the heart of Dudley Square around Dudley Station that were once proud centers of commerce began to be renovated to serve a new generation. In 2005, renovations were completed to the Hotel Dartmouth, once a prominent residential hotel and office building that had been vacant since the early 1970s. 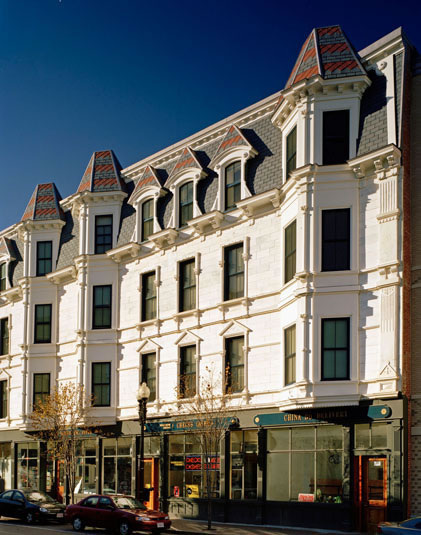 Today, the Hotel Dartmouth is an active residential and retail building that has been magnificently restored to its former elegance. Hotel Dartmouth in Dudley Square today. The upper floors are residential units, while the lower floors house small retail shops. 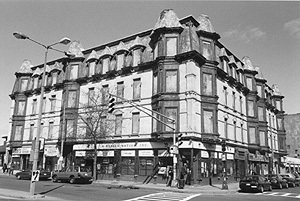 Hotel Dartmouth in Dudley Square in 1999. The bottom floors housed retail shops, yet the upper floors were vacant and the building was clearly deteriorating. Image copyright Historic Boston Incorporated. 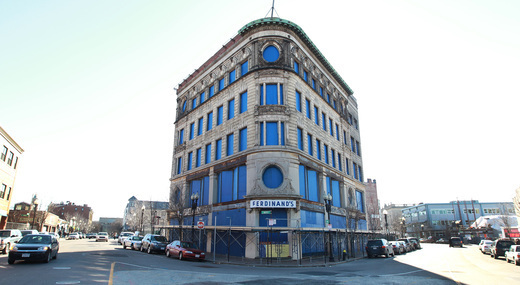 As of late summer 2013, construction is underway on the site of the Ferdinand's building. 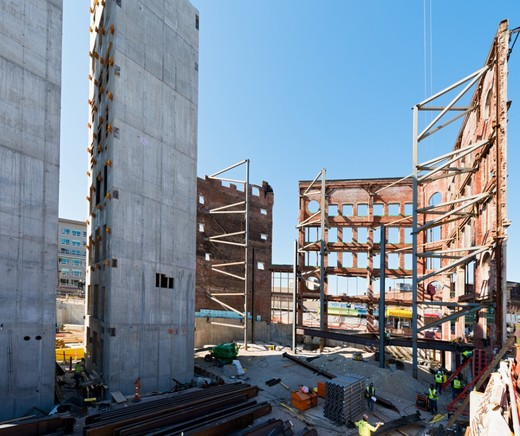 When construction is complete, the building will house the headquarters of the Boston Public Schools with retail space on the ground floor. The front facade of the building overlooking the intersection of Warren and Washington Streets will be fully restored, and a new addition will be built on the site of the former Ferdinand's annex which was torn down partially in the 1990s and completely by 2011 as part of the construction project. Ferdinand's in 2011 after standing vacant for forty years. The windows are completely boarded up, though the facade and original sign remain in promising condition. 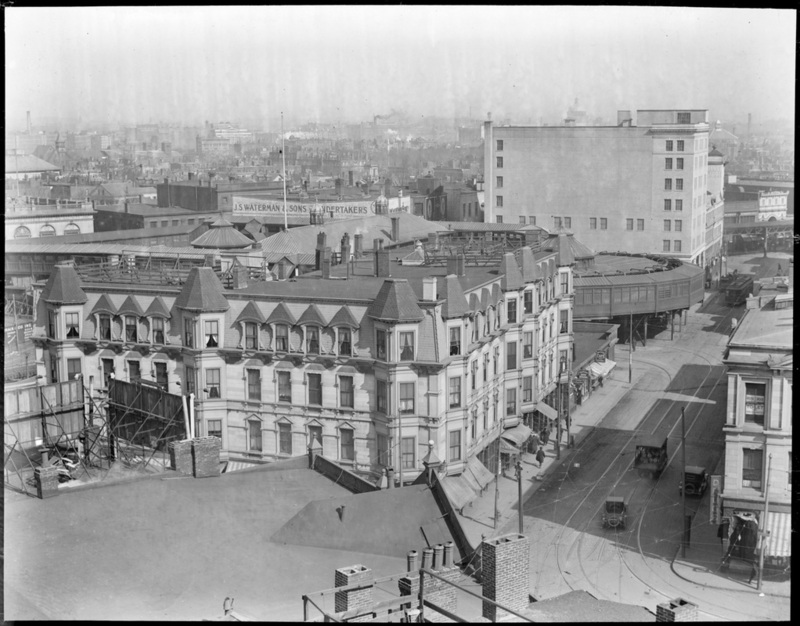 In the left background is the recently restored Hotel Dartmouth; the empty space behind Ferdinand's is where the annex, demolished in the 1990s and late 2000s, once stood. Image copyright Pat Greenhouse/Boston Globe. 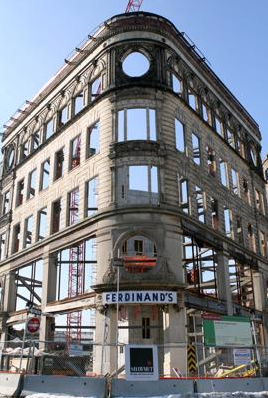 Restoration work underway at Ferdinand's in early 2013. the interior of the building has been completely gutted so that a new addition can be built and the facade can be restored. Image copyright Patrick D. Rosso/Boston Globe. The new addition to Ferdinand's under construction in early 2013. Like many of the buildings around it, Dudley Station has also undergone renovations that have preserved the station's historic origins. As a result, the present-day Dudley Station is remarkably similar to the station that served elevated trains until 1987. While the elevated rails and elevated streetcar (later trackless trolley and bus) loops have been torn down, the main enclosure of the elevated station has been restored and recycled as the enclosure of one of two surface bus platforms that make up Dudley Station. 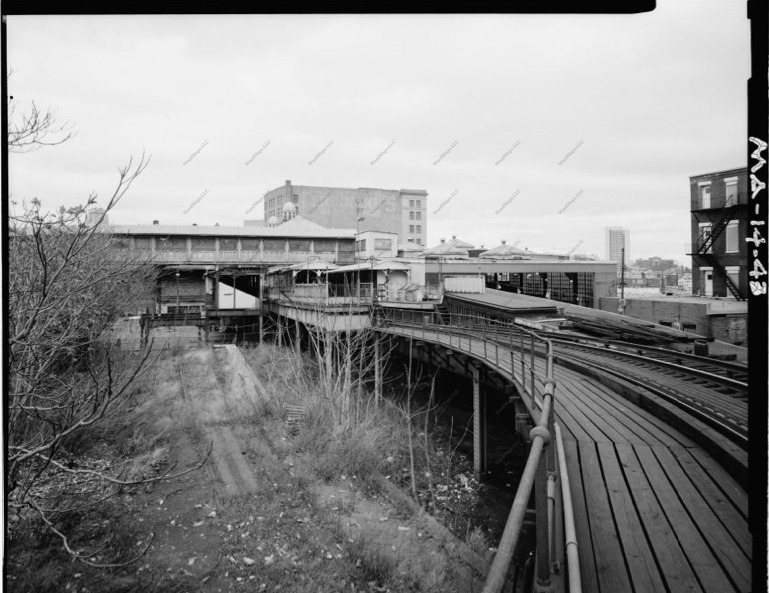 As a matter of fact, Dudley Station is Boston's only remaining station structure that once served the Washington Street, Charlestown, Atlantic Avenue or Causeway Street elevated railways still in active use! Dudley Station today. Image copyright Panoramio user @wgschmidt. Repeat for purpose of comparison of photograph posted earlier of Dudley Station when the El stopped there. 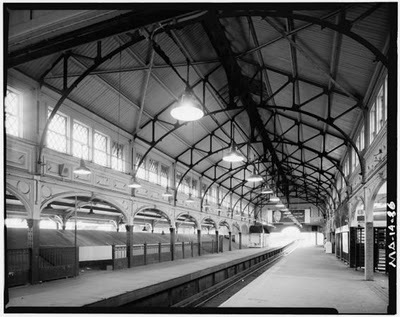 Compare the two photograph above, and you'll see that today's Dudley Station uses exactly the same structure as the El station did. From the adorned arched columns to the ceiling support structure, everything is the same down to the string lights on the ceiling. Even a small booth that must have functioned as an information stand or ticket booth in the El station, visible on the right of the El station photograph, remains today and is used as a CharlieTicket vending machine kiosk, visible at the bottom center of the present day station photograph. Exterior of present-day station looking towards the Ferdinand's building. 1905 postcard showing exterior of Elevated station looking towards Ferdinand's building. Even the double decorative rotundas remain on the also-original ceiling, on which one can still see a half-circle where El trains entered the station. Comparing two exterior photographs of Dudley Station above, you will see that the MBTA basically took the top of the original enclosure station enclosure, the part where the El stopped, down to the bottom of the arched pillars and recycled that as the new bus enclosure. Looking to the right of the exterior view of the present-day station, you will see that an El signal tower also remains on the premises. The only other remaining El signal tower from the original station is at the Seashore Trolley Museum in Kennebunk, Maine, along with the structure of Northampton, the only other remaining original El station. A second enclosure was built for the new platform that very closely resembles the original one across from it. The new enclosure, together with the original station and the signal tower, provide visitors with a fitting welcome to historic Dudley Square and ensure that Dudley Station will remain a significant center of transit history in Boston for years to come. Aerial view of present-day Dudley Station. The structure parallel to Warren Street with the two rotundas on top is the original station, and the structure perpendicular to it and parallel to Dudley Street is the new structure. Note the number of buses in the area serving the station.